Award-winning former ghostwriter Felicity McLean delivers a haunting debut literary mystery that’s already become an international sensation. Australian author Felicity McLean is an international publishing sensation with rights to The Van Apfel Girls are Gone already sold to the US, UK, Spain and France. Part mystery, part coming-of-age story, The Van Apfel Girls are Gone is set in a distant suburb on the encroaching bushland, over the long hot summer of 1992. It’s the summer of the school’s Showstopper concert. The summer Tikka Molloy was eleven and one-sixth years old. The summer she never forgot. The summer the Van Apfel sisters disappeared. Hannah, beautiful Cordelia and Ruth vanished during the night of the school’s Showstopper concert at the amphitheatre by the river, surrounded by encroaching bushland. Blackly comic, sharply observed and wonderfully endearing, this is Picnic at Hanging Rock for a new generation. Felicity McLean is a writer and a journalist. Her writing has appeared in Good Weekend, the Daily Telegraph, the Herald Sun, the Big Issue and more. Her latest book, Body Lengths, was co-written with Olympian Leisel Jones. It won the 2016 Australian Book Industry Awards ‘Reader’s Choice’ for Small Publisher Adult Book of the Year, and it was Apple iBook’s ‘Best Biography of 2015′. As a ghostwriter she has collaborated with celebrities, sports stars, business leaders and others. 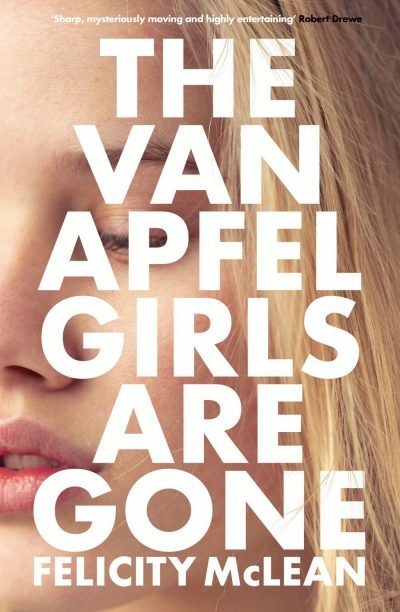 The Van Apfel Girls are Gone is her debut novel. Missing girls … missing chapter? Click here to read the new ending or be one of the first 20 people to email publicity@harpercollins.com.au to win a free finished copy of this stunning debut.